Several cryptic posts from the Facebook page of a group known as the 'Flomo Klowns' put two Southern Alabama schools on lock down for a while Thursday morning. The Flomaton Police Department received information from a parent that her child had been sent threatening messages on Facebook from the group. After confirming the threat, the Escambia County School District put Flomaton High School and Flomaton Elementary School in Atmore on lock down this morning. The lock down was lifted at 11:30 a.m.
Escambia County Schools Superintendent John Knott said the parent of the student contacted the Flomaton Police Department about the incident. "It's my understanding that it's the clown character who has been making waves across the United States," said Knott. "They determined the facts and immediately contacted the school." After speaking with local law enforcement, Knott said the Flomaton High School, which has about 400 students, and the nearly 300 students at Flomaton Elementary School, which sits in the adjacent lot to the high school, were put into lock down. "They came in and initiated their resources to come to the school and begin the process of following our protocol procedure," said Knott. The lock down procedure begins with the school locking all doors to classes and entrances into the building. Next, 30 Flomaton police and Escambia County Sheriff's Office deputies secured the school grounds and searched the area. "Nobody goes out and nobody comes in as we follow through our procedure until the school is clear," said Knott. 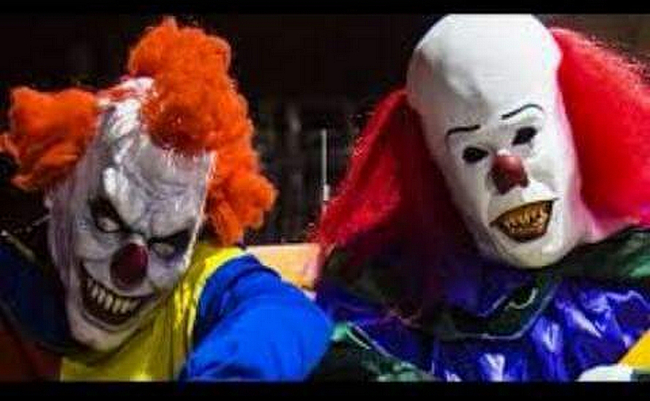 Earlier reports said that the clowns were sighted near the schools campus, but Knott said that report was inaccurate. The hysteria came after the group posted these two updates on their Facebook profile earlier Thursday morning that have now been deleted. He says the images on the Facebook page are hard to look at. "I think it's horrible," said Knott. "We need to send a message to our students don't engage in any kind of communication with them." Knott says the threats clowns have been making on students in recent weeks in North Carolina and Georgia are not to be taken lightly. "We take any threat especially a specific student seriously when it's a threat of harm," said Knott. He wants this to serve as a message for parents and students to mindful of random people sending friend request on Facebook. 39-year-old West Virginian Cindy Underwood is locked up on $10,000 bail after she allegedly put out a cigarette in her boyfriend’s eye, according to court records. The attack, cops say, occurred Monday as Underwood and Jeremy Hughes were arguing in the home they share in St. Albans, a city in Kanawha County. As the pair squabbled, Underwood jammed a lit cigarette into her beau’s eye, police charge. When cops arrived at the residence in response to a destruction of property complaint, they summoned an ambulance, which transported Hughes to a local hospital for treatment of an injury to his left eye. Hughes complained to police that he "did not have sight in his eye." Scientists identified all-time world records for both the longest lightning bolt — nearly 200 miles — and the world’s longest-duration lightning flash — over 7 seconds — according to a report released Thursday. Both records were certified by the World Meteorological Organization, which is in charge of documenting such things. The record-long lightning bolt was spotted over Oklahoma on June 20, 2007, and traveled 199.5 miles, about three-quarters the length of the state. That's almost the distance from New York City to Washington, D.C. The world’s longest-lasting lightning flash lasted for 7.74 seconds on Aug 30, 2012, over Provence-Alpes-Côte d'Azur, France. A report about the records has been accepted for publication in the Bulletin of the American Meteorological Society. This "reinforces critical safety information regarding lightning, specifically that lightning flashes can travel huge distances from their parent thunderstorms," said Randall Cerveny, chief Rapporteur of Climate and Weather Extremes for the WMO and a professor at Arizona State University. "Our experts’ best advice: when thunder roars, go indoors,“ he said. The lightning strikes were detected using extremely sensitive radio receivers, Cerveny said, likening it to how AM radio sounds during a thunderstorm, when the static of the lightning discharge can be heard. "We set out these extremely sensitive radio receivers to 'hear' a storm, to triangulate exactly where the lightning flash starts and ends," he said. So far this year, 35 Americans have been killed by lightning, the National Weather Service said, making it the deadliest year since 2007, when 45 people died. The author of 'It' and many other popular novels maintains that creepy clowns will always be terrifying. The appearance of mysterious figures dressed up as clowns hanging around roadsides and street corners in the dead of night might sound like the plot of one of King's own horror novels, but in recent years this unnerving scenario has been playing out time and time again all over the world. One of the most recent creepy clown sightings occurred in Greenville, South Carolina where police officers have been left perplexed by reports of clowns luring children in to the woods and standing silently on the roadside, staring at cars and pedestrians with an eerie, unnatural gaze. Author Stephen King, who has himself written about a very creepy clown indeed in his novel 'It', maintains that while the phenomenon will pass, clowns will always remain inherently creepy. "Kids love clowns, but they also fear them; clowns with their white faces and red lips are so different and so grotesque compared to 'normal' people," he told the Bangor Daily News. "The clown furor will pass, as these things do, but it will come back, because under the right circumstances, clowns really can be terrifying." So far his comments seem to be ringing true as now police in North Carolina have also found themselves investigating a series of clown sightings across the state including the case of a man who allegedly chased a clown with a machete after it emerged from the woods near Greensboro. Japan’s Notorious Taiji Dolphin Hunt - Frankly...this makes me sick!